AH, TO SUMMER in the chateau in the south of France, ski in St Moritz, spend the occasional weekend in Paris and then jump on the yacht to explore the Med. This is the life for one uber-wealthy British family who have luxurious properties in all of Europe's best locations. Now, for reasons known only to them, they have decided to share - and offer their incredible homes for a select clientele to rent. They've told us and now we've told you but don't spread it around because the six properties (and one yacht darling...) in the Domaine de Luxe, portfolio should only be shared with those who really do appreciate the finer things in life. 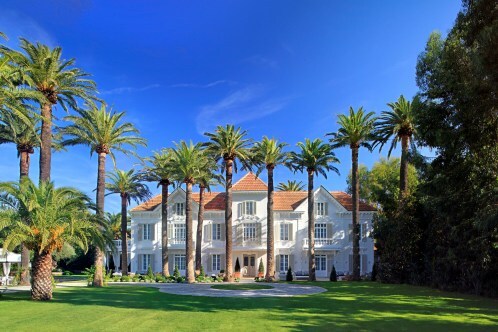 The Chateau St Tropez is rated as the "jewel in the Domaine de Luxe crown". Guests will receive a helicopter transfer from Nice airport to the property which sleeps 16 in total in four suites in the main property and four Suites in the separate Maison d'Etoiles villa. All suites have a lounge area, dressing room and marble bathroom and lead out to private balconies, terraces and gardens. "The Beauty and the bonhomie, sounds and scents, legendary light and colour, the Tropeziene shrug, peacock fashion next to shabby chic." These people obviously know St Tropez well. What is all the more special is that all that energy and Tropez-buzz is just metres from the chateau''s ornate gates, yet inside all is tranquillity. The contemporary Villa O in Cap Ferret is a contender for The Luxury Travel Bible's favourite in the collection (although it is a close call). Villa O is a four-bedroom villa with en-suite bathrooms for eight guests and also features a two-bedroom guest house with en-suite bathrooms which sleeps four guests. Villa O has many social areas, landscaped gardens, a screening room, gymnasium and a swimming pool, but it wins for its stunning views over the ocean from its high point on the hill. Its location makes it the perfect retreat for the Cannes Film Festival, Monaco Grand Prix and other events on the Cote d'Azur. El Huerto del Baron, Marbella has five bedrooms to sleep 10 guests. Befitting of a property named 'Orchard of the Baron' there are fruit trees planted in the grounds. The family also own a two-bedroom apartment, Puerto Romano in Marbella. The Paris apartment, No 7 Rue de Verneuil, sleeps four guests in two bedrooms and also comes with a staff bedroom. It is located within walking distance from local shops and restaurants. Winter sports enthusiasts should head to the St Moritz penthouse (sleeps two guests) where the concierge will greet you with Champagne and canapés before you can go and hit the slopes. The collection also extends off dry land to include 30 metre Benetti Tradition yacht "Jazz" which sleeps eight and comes with full crew. The yacht can be hired in conjunction with Villa O for exploring the local area or by itself for a cruising holiday. The owners don't want their identity revealed. However, what The Luxury Travel Bible can say is that they are a British family and the kind of people who frequently appear on London's Sunday Times' Rich Lists and Who's Who lists. And you don't need us to tell you that the family has taste and a love of chic, understated design. A glance at the properties will do that. Each is a home away from home with personal touches such as the family''s favourite books or DVDs for guests' use, fresh flowers throughout the stay, daily newspapers and magazines, luxury toiletries, Wi-Fi and Bang & Olufsen entertainment centres. There is no minimum or maximum length of stay for each property. Each property comes with its very own 'little black book' of contacts via the house manager. With access to the best local chefs, masseuses, butlers, housekeepers, nannies, drivers and guaranteed access to the best restaurants and clubs in town The Luxury Travel Bible readers will receive the service we know you deserve. While the ultimate luxury may be complete privacy The Luxury Travel Bible is prepared to extend that to some of our best friends for a special occasion. With your own chef and staff, stunning views and beautiful rooms these properties lend themselves to (refined and elegant) entertaining. The Luxury Travel Bible thinks Chateau St Tropez would be the perfect location for a wedding and to wow the new in-laws. We suggest the main chateau for the bride's family, the separate villa for the groom (let's keep things traditional and separate the lovebirds in the lead up to the big day). There are plenty of nearby hotels to accommodate the guests who don't make the grade to stay in the Chateau. The concierge team can organise all aspects of the wedding from licence to cake to bridal bouquet. The team can also design the wedding and reception, whether it is intimate or grand, simple or elaborate, to best reflect the couple for up to 200 guests. So... who do we want to invite with us?